Aloha! 12 Jumbo Faux Silk Hawaiian Leis! Each Jumbo Faux Silk Lei measures 2-1/2"-3" wide! Each Premium quality lei measures 36" around which fits all ages beautifully. 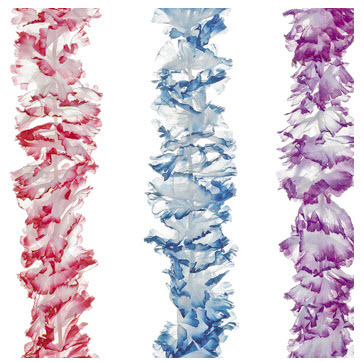 These are high-quality leis great for Luau's, Weddings, and any other Tropical Event! Note: Colors vary in the pack. You are not gauranteed a certain color because they are prepackaged by the manufacturer.